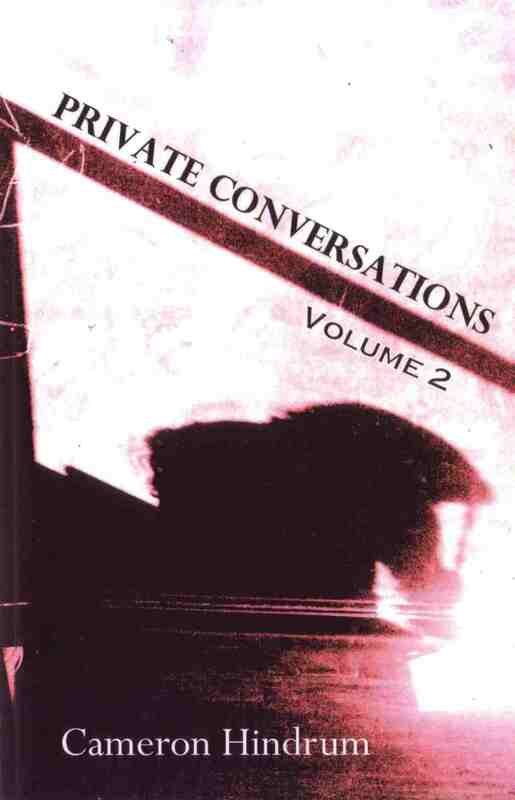 Private Conversations Vol 2 by Cameron Hindrum. Walleah Press, 2012. Cameron Hindrum is a familiar figure amongst the slam community, a big presence both on the stage and physically. He has comparatively recently ventured into the world of words on paper with his novel the Blue Cathedral published in 2011. I always expect a lot from Walleah Press, a bright light in what can be a narrow, dark poetry tunnel. They publish mostly, but not exclusively, Tasmanian work. As usual the production and design of Private Conversations are first rate. It is a 32 page chapbook with space to spare, I did wonder, however, why they went with the two-volume chap book model. There is so much to like about this book. Hindrum’s is an openhearted voice capable of the belly laugh, freely given love and shared poignancy. If Australian poetry needs a medical plan to treat its chronic disease, this inclusive veracity will clearly be a core part of the treatment regime. Language is appropriately simple and clear. By the water, find the beach. The horizon’s always out of reach. so much achieved in so few words, so unforced. Consistently over decades I have seen adept page poets murder their work on stage through arrogance,laziness, sheer incompatibility or incapacity. Conversely, many of the leading performance poets fail to make the transition to the printed page. They are not mutually exclusive mediums, but each requires a certain critical mindset to be applied. Many poets who straddle both mediums will say that certain pieces can be performed regularly but will not appear in any book. Other works would almost never be read out loud. From a slam poet like Hindrum the challenge really was to look again at all his work and make sure they function on the printed page. “On explaining the facts of life to a six-year-old” and “On finding 20,000-year-old footprints near Lake Mungo, NSW” are examples of work that generously reward both the reader and the audience equally. But this doesn’t apply to all pieces with a little lazy language detracting from otherwise engaging narratives. “Love poem for Jack and Sylvia” was a joy to read but the constant repetition of the word old, while I saw it working phonically, just served as a dragging chain on paper for me. Having said this I return to my core point that this is a book well worth reading and possibly more importantly a book that makes one hungry for Hindrum’s next. Wow, I didn’t know Cameron was this witty! I’ll have to get this li’l book for a big laugh – and an insight into Cameron’s many talents. Thanks, Les. I agree, it’s a wonderful production, and the poems are as big-heated as the man himself.